We are committed to preserving our rich Anglican music tradition by providing excellent music for worship, supporting outside groups as well as offering our children hand-bell choir so they will learn to read and and love church music too. Children's Handbell Choir performing for the first time at the September 16th worship service. Our new organ was installed at Church of the Apostles in August of 2018. Built in 1985, it was previously the antiphonal organ at St. Francis Xavier Cathedral in Green Bay, Wisconsin. 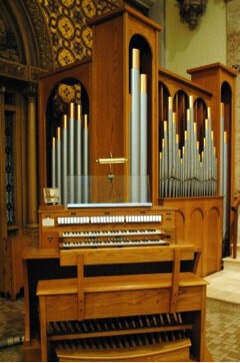 It has 5 ranks and 389 pipes – perfect for the acoustics of our sanctuary. You can hear the organ at the 9:30 Sunday morning service each week, at Evensong several times a year, and in our concert series. The Apostles’ Choir rehearses on Wednesday evenings (6:30-8 pm) and sings at the 9:30 service most Sundays between September and May. Repertoire encompasses the Anglican choral tradition, traditional spirituals, contemporary gospel, and cutting-edge new music. Guest musicians from the Arizona Repertory Singers and the Tucson Symphony Orchestra occasionally join the choir for special occasions like Choral Evensong, Christmas Eve, and Holy Week. Anyone with a love of music is invited to join the choir. Children at Church of the Apostles receive musical training in singing and in handbells, and occasionally play and sing in worship services. April 20 at 7:00 pm – The Great Vigil of Easter - include music by Mozart: a Missa brevis and a church sonata with an organ solo accompanied by a string trio from the Tucson Symphony Orchestra. ​Elliot Jones holds degrees from New York University, Indiana University, and the Doctor of Musical Arts in choral conducting from the University of Arizona. He is music director of the Arizona Repertory Singers, and the founding host/pianist of Downtown Tucson's Piano Bar at Old Town Artisans. 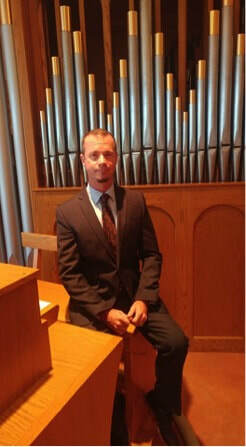 As a singer, he has performed as baritone soloist and professional chorister at The Church of St. Mary the Virgin, and Grace Church in New York City, Christ Church in Wilmington, Delaware, and at Exeter and Truro Cathedrals in the U.K. As a music director and conductor he has led music programs at Mountain Shadows Presbyterian Church in Tucson, and Asbury United Methodist Church in Delaware. He was the founding artistic director of the Rainbow Chorale of Delaware, the first GALA Choir in the state. He has twice led performances at the National Cathedral in Washington, most recently of Gregorio Allegri’s iconic work, Miserere. Dr. Jones has served on the music faculty at West Chester University of Pennsylvania, Wesley College, Culver-Stockton College, The Music School of Delaware, and Saint Andrew's (Episcopal) School. His students regularly win prestigious vocal competitions, have been accepted to All-State and All-Eastern Choruses, and have appeared with such performing arts organizations as the New York Gilbert and Sullivan Players, the Cincinnati Pops Orchestra, the Tucson Symphony, and Opera Delaware.